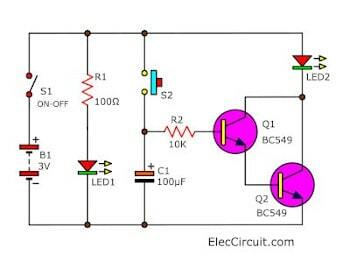 This circuit is based on learning of the discharge and charge of the C, which can be used as a timer circuit and can be applied in the off electrical appliances. The application has also put relay instead of LED can be enabled. When you click the switch S1 will cause LED1 light told state ready to run S2 is a timer switch. On press switch S2 current will flow to the C1 charge fully. Then to discharge out through R2 to limit current flow to the bias for transistor Q1. Q1 and Q2, which work together to Darlington Compound. To have growth rates high to drive the LED2 light over time as C1 discharge all Q1 and Q2 stops LED2 is off if you want the timer circuit is longer. Then add the C1 and if you want a little time. to reduce it to C1. A friend of me wants 10 second delay timer circuit at can turn ON Fan 12V at use in an automobile. By fix the period of time about 10 second. He sets conditions that must use electronic part economize and seek easy with. I then choose transistors and relay be control electric fan equipment follow the circuit in a picture. The value delays can fix with R1 and C1 which there is a formula calculates 0.5 x R1 x C1 . When press S1 wait for about 10 second relay then work turn on give the electric fan works. The detail is other see in the circuit. I would like to know if I can you this circuit and would like a delay (LED on for 60 minutes) If I can use a bigger condenser and only one transistor? Please try to replace C1 with 220uF capacitors. It may times is 60 minuts as you want I am sorry that never test it with this value. Please check circuit again on breadboard, such as lead of transistor or capacitors. Please slow… check. This circuit works great. Hello, what if I want to add a small 5V relay, and power the circuit from 5V? I would place the relay at led 2 position, including a diode across the coil. if i can replace 12v. If 12V is used, will it change the 30 min to a shorter time? Thanks. This won’t even do 30 seconds let alone 30 minutes. 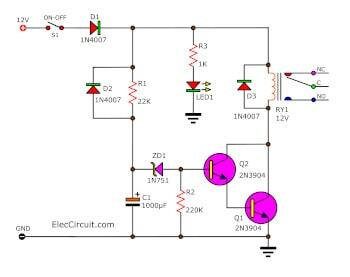 This circuit works although you may have to play with the capacitor values and resistor value at the base of the transistor. I got a different time for the same values.Also make sure your capacitor and transistors are working properly. My question though is, if you push it and let go immediately versus push and hold for a few seconds and then let go. Will it make a difference in the time? Ok so I found out when you push and hold the button for a few seconds and release, the timer goes even longer. Is there a way to make it the same time when you push and hold vs push and release? Thanks.